The tool that clamps the tubing material against the bend die as it rotates to form the bend. There are two specifications of primary importance in a clamp die: Length and cavity texture, which are related to each other. The shorter the clamp, the rougher the cavity surface must be to maintain the force of the grip on the tube. A formula for clamp die length is: L = t x k – r where “L” is length, “t” is tube diameter, “k” is a constant for rigidity, and “r” is centerline radius. For most round tubing, 5 is a good value for “k”. Increase “k” for non-round tubing, hard-way bends, and rigid materials such as nickel stainless, titanium, and superalloys. A minimum value for “L”, if the clamp die cavity is smooth, is around two times the tube diameter. Increase this minimum as you would increase “k”. Serrations, knurling, and carbide impregnation roughen the cavity surface, therefore improve the clamp die’s grip upon the tube. Therefore, the rougher the cavity surface, the shorter the clamp die can be. Serrations and knurling generally permit “L” to be about half of what a smooth-cavity clamp die length would be. With carbide impregnation, about two-thirds the smooth length. 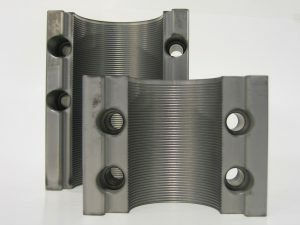 Consequently, these cavity textures are a good solution for mid-tangents (i.e., a tangent between bends) that are shorter than the ideal “L” value for a smooth-cavity clamp. However, if a mid-tangent is significantly shorter than the ideal “L” value for textured cavity clamp, then a compound cavity may be the best solution.